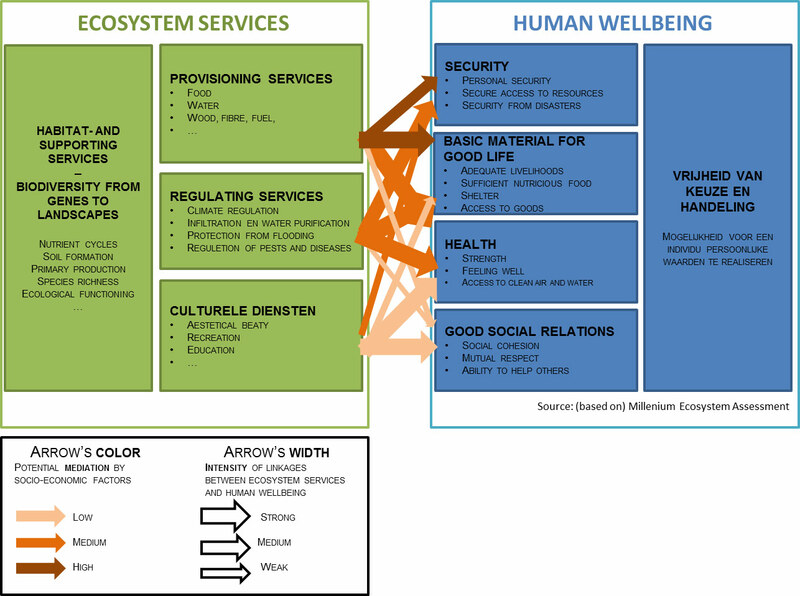 Ecosystem services link ecosystems with human well-being. Our economy, health and survival depend entirely, albeit often indirectly, upon natural resources (Millenium Ecosystem Assessment, MA 2005). Together with population growth and growing per capita consumption rates, the demand for natural resources increased, and the impact of this consumption pattern became more and more clear: natural resources, supposed to be infinitely and freely available, are becoming scarce or degraded (MA 2005). Health problems, natural disasters and high costs for technical replacement of natural regulating functions have increased the need to adopt a broader view and strategy on resource use. Figure 1 Ecosystem services link ecosystems to human well-being. Based on MA 2005. Since the publication of the Millennium Ecosystem Assessment in 2005 the concept of ecosystem services has caught widespread attention (MA 2005; www.maweb.org). Ecosystem services are defined as ‘the benefits which people derive from nature’ (Costanza, 1997; MA, 2005). Fisher et al. (2009) consider ecosystem services to be ‘the aspects of ecosystems, utilized actively or passively, to produce human well-being’. This definition includes ecological phenomena that are used or consumed, directly or indirectly, by humans. A benefit to human wellbeing, generated by an ecosystem service, mostly requires a human investment (e.g. drinking water requires a pumping installation and a distribution system). The service itself however originates from an ecosystem function, being the set of structures and processes which eventually produce the service. Sometimes, several more or less separated functions are appropriate to describe the supply in intermediate services. Structures and processes are not exclusive to one single service: they contribute to several services and often exhibit trade-offs. For instance, anoxia (lack of oxygen) is a condition in an estuary that is generally considered as negative for provision of many services (e.g. food web support, service: fish provision) related to primary production, but on a microbial scale, it provides the necessary conditions for improved nitrogen removal (service: water purification). As such, every single service is connected directly and indirectly to an intertwined web of structures and processes, finally supported/insured by the functioning and resilience of the entire ecosystem. Understanding of this functioning is thus essential to manage the services and benefits derived from them. The field of ecosystem services aims to classify, describe and assess the natural assets, their supply functions, quantification, valuation and management. Ecosystem services are now generally categorized in provisioning (food, water,..), regulating (flood control, air purification,..), and cultural (recreation, aesthetic experiences,..) services. All of those are eventually generated, supported and ensured by ecosystems in all their diversity (supporting services or broadly defined biodiversity) (Figure 1, MA 2005, TEEB 2010).